Dutch trumpeter ERIC VLOEIMANS returns to the UK to play a one-off gig at Pizza Express in Dean Street on Wednesday 13 December as part of the Going Dutch project. A musician with a busy diary but who still found time to deputise for Italian trumpet master Enrico Rava at one hour’s notice a couple of weeks ago, Vloeimans works across the spectrum of music. He studied classical music at the Rotterdam Academy of Music and jazz in New York with Donald Byrd and counts the time he spent with the late John Taylor among his most cherished musical experiences. He recently won the Netherlands’ oldest and most prestigious music prize, the Edison Classic Audience Award, for the sixth time, this one for the album Carrousel, recorded with the ensemble Holland Baroque. 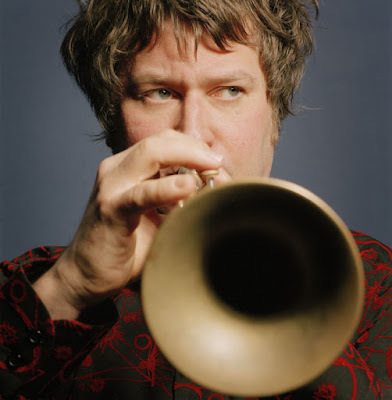 LondonJazz News: Was trumpet your first instrument? LJN: What attracted you to it; was there any particular person or musician who made you want to play? EV: There was a TV show in my youth where a famous folksinger sang about a trumpet in the king’s army and it was a beautiful shiny silver trumpet and I was mesmerized. From that moment on I was totally sold on the trumpet. I must have been seven or eight. LJN: When you went to the academy was it your intention to become a classical soloist? EV: At that time, I didn’t know. I went to the conservatory because I wanted to play trumpet, but I really didn’t think that far ahead. LJN: How did you become interested in jazz? EV: At music school - before the conservatory – my teacher was already improvising. And when I arrived at the conservatory, during my classical studies, I met Cees Smal, who ran the jazz department and the big band. When I saw what was happening in the jazz department, I was really taken with it and switched from classical to jazz. I also met Niko Langenhuyssen, bass player, pianist and composer. He had his own orchestra, Vaalbleek, which means something like pale bleach. It was the orchestra of the community garbage department. And it was a reaction to all the conventional big band music of that time. It had something nice and dirty. The music from that world tugged even harder on me than the music at the conservatory. LJN: You spent time in New York, studying with Donald Byrd and playing with Frank Foster and Mercer Ellington; what were some of your favourite experiences? EV: Meeting all the people, going to all the concerts, playing all the gigs, just LIVING! Six months in a city like that is very exciting for a young trumpet player. LJN: You worked with John Taylor and enjoyed a special musical relationship with him; tell us about that. EV: I felt that I could, in a musical way, say anything to John Taylor, and that he would hear every detail that I played. Until the moment I met John Taylor I had never performed with anyone that could incorporate so much minutiae in his work. He was a very important influence in my musical life, and I regret deeply that he is not with us anymore. LJN: You work across a wide range of music from chamber music to free improvisation to electric grooves; do you have a style you particularly enjoy or do you prefer to keep a variety of options open? EV: I do try to keep all the options open, because in the not-knowing is the almighty truth. For the rest, I try to be Eric Vloeimans at the fullest. LJN: Are there any instruments other than the trumpet that have that have influenced your sound and phrasing? EV: It’s hard to answer this specifically because I listen to music in its entirety, and the instrument is always subservient to the person. I’ve always felt the trumpet in a muted manner – Chet Baker gave me the inspiration for my ‘airy’ sound, and when I continued that way, I discovered Jon Hassel, and instruments like the shakuhache, clarinet, duduk and they gave me the challenge to bring a wooden tone to a brass instrument. LJN: You’re working with Steve Lodder and Martin France alongside Dutch bass player Jeroen Vierdag, at the Pizza Express, how did you meet Steve and Martin? EV: I met Steve Lodder at Dartington in August 2016, and Martin France through Django Bates – with whom I played at the Pizza Express before, I think it was 2010. LJN: What feelings and memories would you like audiences to take away from your concerts? EV: Music can do so much with the human soul and I can just hope that every time I play, people go home happier than when they arrived. Rob Adams is a freelance journalist based in Edinburgh. He is working with Podiumkunste NL on PR for the Going Dutch project.